4VRC © technology: means the adoption, as a conductor, copper baked four times, in place of the 2VRC used by other competing companies. This technology makes it possible to achieve greater purity than that obtainable through normal cooking (two times). 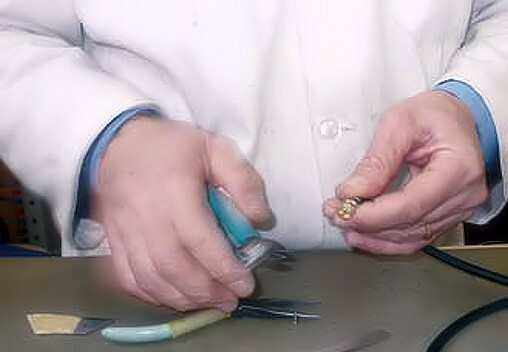 Also means that the braid/capillary is processed at different temperatures four times instead of two. The purity of the source material of the cable is decisive. Copper is made available for processing in the form of wire rods (16 mm section and 100 feet long), which is extruded and calibrated until it becomes a strand of 0.10 mm section for 10,000 meters in length. 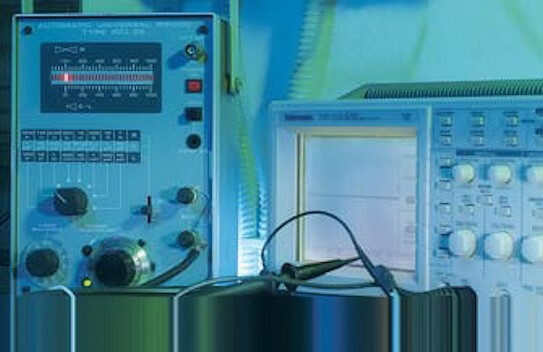 The greater the purity of copper, so it will be easier to achieve small sections, with high endurance and fragility modest features that allow a perfect calibration and homogeneity of discriminatory elements section, especially in the case of power cables, where more is reduced the diameter of the capillary, the more it reduces the skin effect. In smaller signal cable is the capillary diameter becomes more simple get the right compromise with the dielectric and the amount of graphite used in mid-range cables and high-end. 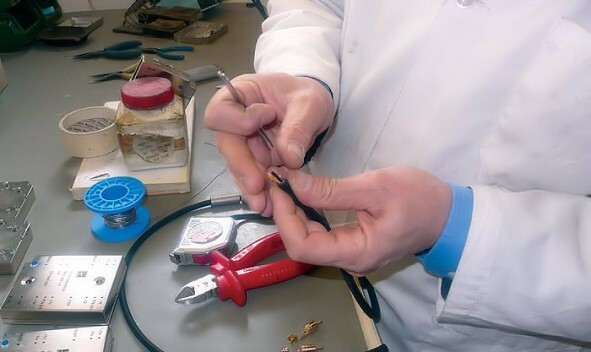 This procedure ensures that the filament is much purer than those processed with traditional technology 2VRC, ensuring that values of inductance, capacitance and resistance. Graphite: mixed with copper in 4VRC © technology, allows to block the noise generated inside of the cable from the passage of an electrical signal (which is nothing the musical signal) to bring out a perfect signal without any introduction of noise that would spoil the final result. For more information go to the folder "Sound magazine Visit: lead" or click here. Resistance: is linked to features of metallic material that constitutes it. A good cable should have a little resistance to ensure low attenuation of the signal. Low value of this parameter is important especially in presence of high amplitude signals to ensure S/R ratio is high enough. Capacity: If the capacity and low, greater will be the speed of propagation of the signal. The capacity of the cable increases proportionally to the length of the cable and is linked to the characteristics of the dielectric material given that not all the energy of the signal cable is meant to arrive at destination, as a part of it goes to load metal conductors of the cable, as it stores electrostatic energy, as with an armor of a capacitor. Greater the permittivity of the cable, the greater the energy that is stored by the dielectric to be released, causing a phase shift that wipes out a portion of the transmitted signal by creating a background noise and not linearity of the musical signal. A good dielectric material has a low dielectric constant value so as to allow greater speed signal propagation and a lower capacity of the cable itself. For this our used inside the our cable , XLPE dielectric, which for this type of "work" is 100 times better respect to Teflon (the dielectric used by most manufacturers of cable). Inductance: this value must be less than possible. 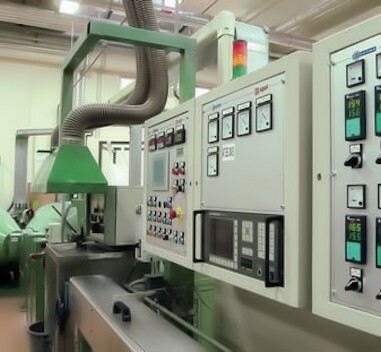 The inductance is related to the geometric and structural parameters of cable: depends on the diameter, the quality and refinement of the conductors and their configuration. General cable In braided geometry have low inductance; high inductance causes storage of electromagnetic energy that is then returned in the form of signal distortion. The greater the inductance, the more it reduces the bandwidth. Selection and processing of the raw material: the joint management of these two aspects to keeping quality under control. 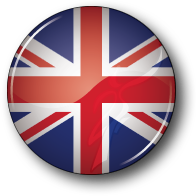 Then speakers productive choices as then use various technologies, such as our exclusive 4VRC ©technology, for have greater purity , respect to the normal cooking. 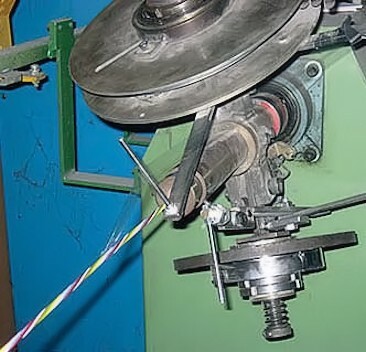 The purity of basic cable is critical for several reasons: copper is made available in the form of wire rods (section 16 mm and 100-meter-long) that will be cued, extruded and calibrated until it becomes a narrow strand section (in our case against 0.10 mm respect 0.20 mm of our best competitors) and 10,000 metres in length. The greater the purity of copper, much simpler will be get smaller sections with a constancy of section and low fragility. 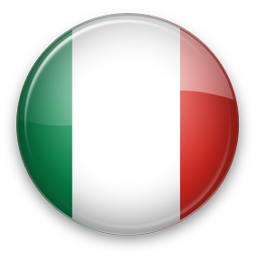 Constancy of section: is a discriminating element, because it assures constant values which depend on the characteristic parameters of the finished product. 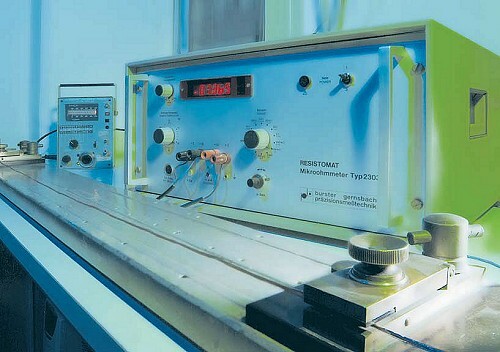 If the consistency of the section is the result of the quality of the raw material, the verification of this quality takes place upstream of production, with the control of the resistance for KM and "Valley" with the scanned three parameters: the primary wire diameter, the diameter of the primary conductor insulation and diameter of outer conductor. This is the reason why you don't make major 100 m coils in the audio field and would be very costly to maintain such a standard for lengths. If the copper is not a minimum 95% copper or a copper alloy which is outside the optimum electrical characteristics (type derived alloys from lead), can't get reduced diameter strands. By a cable of this type rarely gets a strand below 0.20 mm. Cable stress also affects the centering of the strands and the dielectric: If centering is not exactly the most subtle tends to break more frequently (the radius of curvature deteriorates the performance especially on interconnects, less on those speaker cable). For this reason the minimum core of the coil where it is stacked the signal cable is 80 mm in diameter while those in power 160 mm is. 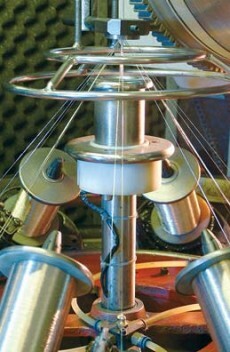 Centering: the way the wire, insulation and sheath are assembled is the next step in the creation of a cable. 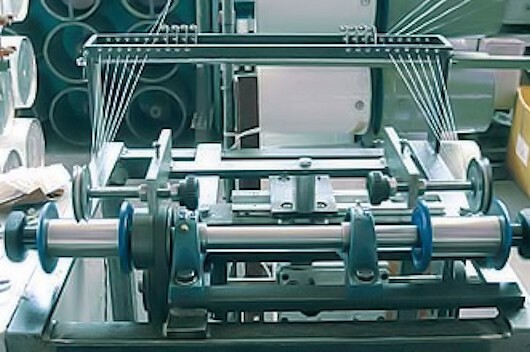 Of course companies series have sophisticated machinery for braiding and twisting that must be absolutely precise and constant and cannot be done by hand. Internal and external Sheath: has its own relevance: for example, drawing must take place so that the Interior sheaths that adhere to the dielectric are doubles and perfectly coherent with the conductive material, otherwise the presence of noise in the signal transmission. Even for this most valuable cable we use graphite to "neutralize" the noise. 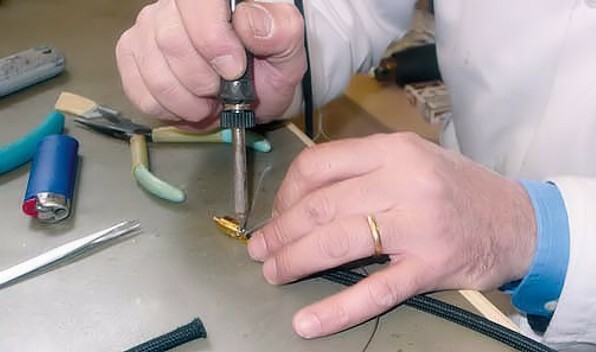 Soldering or crimping: must be in way circular and not square , otherwise you will have a bottleneck of conductive material. 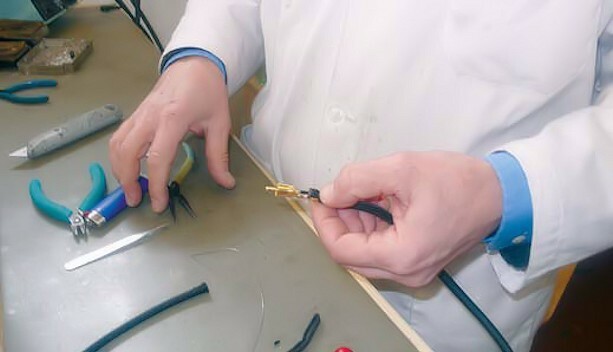 Welding must be temperature controlled, so that the tip soldering iron is at constant temperature and of course the connector must be of quality. The connector of course you won't have to peel, because in this case, after many listings the connector would tend to have a crack, creating a sort of minimizing the air passage of the musical signal. 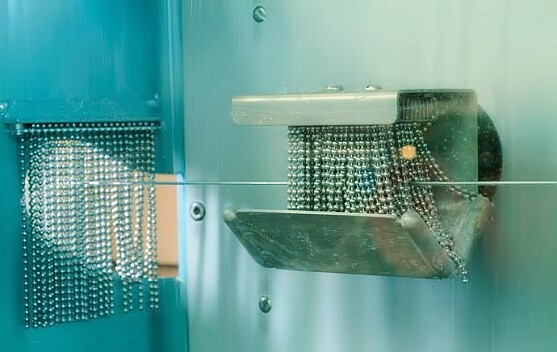 For this quality connectors provide multiple passes of a galvanic tinning of the piece, then chrome plating is the final bath, rhodium plated or otherwise. Controls: a series of checks, both on cable in Hank that the finished product, guaranteeing a consistent performance. For the cable Hank before being released must be controlled electrically (if is in phase, expected resistance, ect.) with electronic equipment. HiDiamond us is what we do. 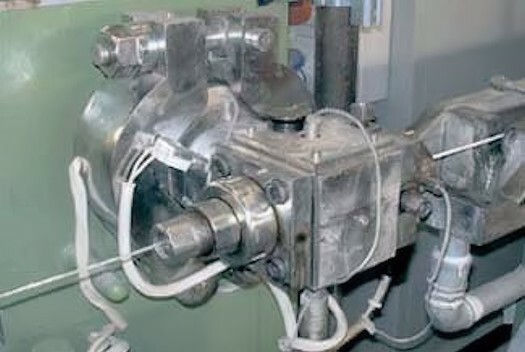 Final stage: Arrive in the end and the cutting and the insertion of the connectors with its welding or crimping tool. Here we use high quality tin , based to silver of our production. Final tests with tear from control connections and capacity measures again, resistance and inductance to ensure a uniformity of performance.